A while back I made a bit of a mistake. I wrote about Stuart Klipper, and in particular his book, “The Antarctic: From the Circle to the Pole”, here, and I was pretty enthusiastic about it. The problem is I didn’t realise quite how rare it is, and a few days after my post, coincidentally or not, Amazon and all other vendors (for example the excellent Longitude Books) were out of stock. Bugger. I did manage to get Amazon.de to take an order, but every now and again they send me a stream of undecipherable Germanic e-commerce babble which I assume means they’d love to take my money but they can’t. So I was pretty surprised not to mention happy to discover Amazon UK suggesting that I buy it new from a 3rd party vendor for just £7.22. And it’s just arrived. 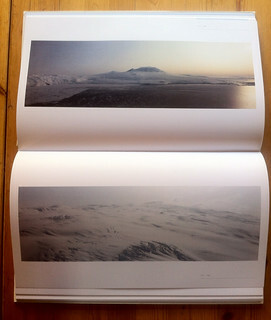 Over the past few days I’d been enjoying Joseph Holko’s Antarctic images, and feeling a little intimidated by them. They’re dramatic, full of contrast and vivid flashes of colour, and sharp enough to cut through steel. They grab attention. I despair of ever being able to get anywhere near this standard. But although I don’t in way want to dismiss them, I’m not sure I ever actually remember Antarctica looking like that. 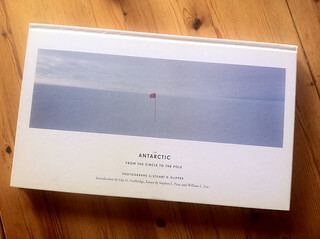 Antarctica looks the way Stuart Klipper photographs it. It’s mysterious, unattainable, incomprehensible in it’s alien vastness. It’s really not the world of highly saturated dramatic icebergs and penguins that we’re getting increasingly subjected to. 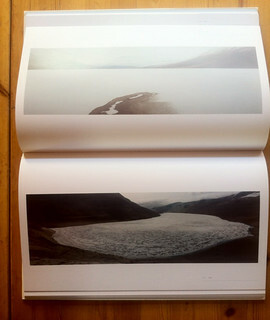 Stuart Klipper lets Antarctic speak to us, rather than impose his vision on it, and it makes a huge difference. He doesn’t go the uninvolved, dispassionate lengths of the more conceptualist art landscape crowd, there’s still a considerable emotional attachment involved, but you get the impression of a photographer who has taken his time to take a long look before pressing the shutter release. Of course, Holko will sell, and Klipper probably doesn’t much. And Holko is a photographer, while Klipper has at least one foot in the “artist” camp. These are just observations, Joseph Holko is a fantastic photographer, and I’m just using his work to contrast with Stuart Klipper’s, I’m not being judgemental. But although I certainly don’t claim any artistic merit for myself, I do feel that my own photography is somewhat validated by Klipper’s. Sure, I’ve tried to go for the in-vogue ultra-impact approach myself, but I’m not comfortable with it and I think it shows. Which is probably why in my heart of hearts I prefer my XPan work. Not specifically because of the format, but because it’s on slide film, and there’s very limit scope in pushing that beyond what-you’ve-got-is-what-you-get. Anyway, I’ve got a book to read tonight.